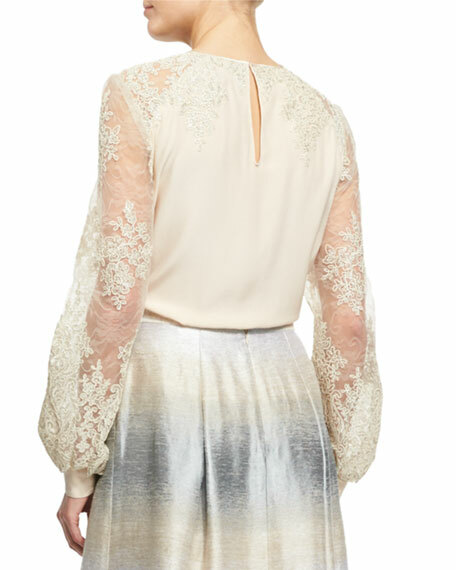 Kay Unger New York matte silk blouse with embroidered lace shoulders and sleeves. Approx. length: 23"L from shoulder to hem, 26"L down center back. Kay Unger New York had a vision: a collection of feminine day dresses, evening gowns, cocktail dresses, and suits that pair pretty color palettes with flattering silhouettes and perfect-fit tailoring. That vision manifests itself today in every piece. For in-store inquiries, use sku #1761174.